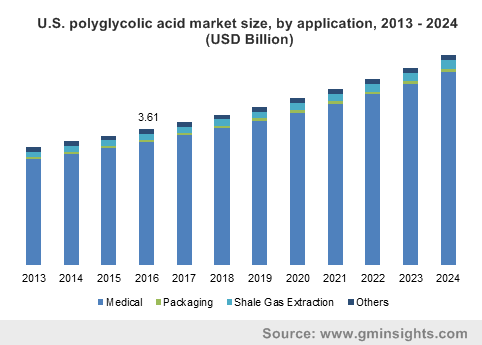 The growth prospects of polyglycolic acid market seems to be quite pronounced, given the growing commercial utilization of the product in healthcare domain. The imperative deployment of biodegradable polymers, especially those belonging to polylactic and polyglycolic acid (PGA) has gained humongous importance in the field of orthopaedics. Pertaining to its unique blend of physical and chemical properties, polyglycolide can be engineered in accordance with the particular applications. The widening outreach of polyglycolide market in medical space majorly grounds on this fundamental factor. In fact, PGA sutures have been gaining competitive advantage over conventional non-absorbable sutures that are made from nylon. In this regard, it is imperative to mention that of late, polyglycolic acid industry has been gaining a substantial momentum in tissue engineering. Perhaps driven by the fact that these biomaterials can be easily molded to porous scaffolds, bioactive agent, and extracellular matrix components, they are recognized as an integral support for tissue development and regeneration. The application spectrum is further diversifying with the onslaught of effective research initiatives and technological advancements. Recently, a team of researchers from MIT, Harvard University, and 480 Biomedical, have made to the headlines with the announcement of a highly flexible, and biocompatible medical implant, that is claimed to be made from braided polymers mainly polyglycolic acid. Subsequently being coated with PGCL (poly(glycolide-co-caprolactone crosslinked) elastomer, this implant is much more stronger mechanically than conventional metallic stents. Experts have been already raving about this platform technology, claiming it to be disruptive for entire polyglycolic acid industry trends. The product is deemed to garner mass popularity in soft tissue engineering. This is due to the fact that most of the soft-tissue implant available nowadays fail to mimic the exact properties of the surrounding tissues. The new device, pertaining to its unique properties can prove to be fruitful in treating soft-tissue diseases, cite experts. The commercialization of this groundbreaking implant is certain to stimulate the revenue graph of polyglycolic acid industry from medical applications overall, which procured almost 60% of the global share in 2016. Global PGA market is not only replete with healthcare domain, though it is one of the most lucrative growth avenues where the business space has garnered significant monetary returns. Besides medical applications, the industry stands to gain remarkable proceeds from packaging sector. One of the major challenges that majority of the packaged food giants are dealing with is extending the shelf life of the food. Numerous initiatives across the globe have been undertaken worldwide to come up with recyclable packaging solutions, exploiting the potential of polyglycolide. In this regard, the project REFUCOAT has grabbed much of the limelight in Europe polyglycolic acid marketplace. Backed by the European Union and coordinated by Spanish Plastics Research Center, AIMPLAS, the main objective of the project is to develop new alternatives for food packaging in a more sustainable way. Allegedly, under the project, the nation aims to replace all non-recyclable barrier materials in multi-layer films with bio-derived recyclable polymer coatings. As per authentic reports, experts are planning to amalgamate polyglycolic acid with modified silica oxide for formulating a hybrid coating, that is deemed to possess water vapor and oxygen barrier properties. Needless to mention, on being commercialized, these advanced packaging solutions are bound to augment the regional polyglycolic acid industry, which is forecast to witness a Y-O-Y growth of 8% over 2016-2024.For the record, the project involves 12 partners, spanning across five countries. Speaking of the competitive landscape, overall polyglycolic acid market is claimed to be monopolistic, Kureha Corporation being the sole industrial scale manufacturer of the polymer. Excessive cost associated with polyglycolide production is deemed to be the chief deterring factor hindering the market growth. Add to it, the biomedical applications of the polymer, as per experts’ opinion, would also be somehow restricted, on grounds of its low solubility and acidic product discharge during degradation. As a result, an anticipated trend of increasing demand for copolymers of glycolide with caprolactone or trimethylene carbonate for medical purposes is likely to be witnessed in PGA industry over the ensuing years. All in all, the profitability graph is reported to be steady and the market is forecast to exceed a valuation of USD 9 billion by 2024.